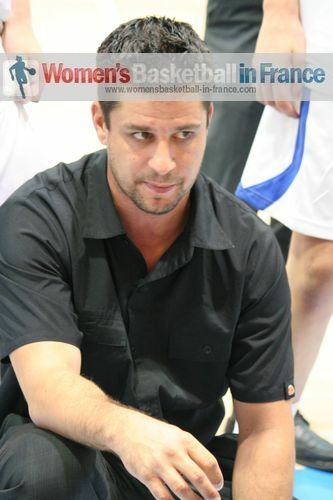 Arnaud Guppillotte's youth basketball season is drawing towards the highlight with the 2013 U18 European Championship from the 15 until 26 August 2013. Two players from the silver medal winning team from the U19 World Championship join the team to leave him with a 14-player training roster. Veuillez trouver en bas de la page l'information en français sur le championnat d'Europe de moins 18. Although the addition of Aby Gaye and Clarince Djabdi-Tabdi comes as no surprise. They only join up with the team until 5 August 2013. In the meanwhile the following players have been released from the 2013 France team: Brenda Agblemagnon (Arras), Mathilde Combes (Bourges Basket), Bérangère Dinga M'Bomi (CFBB), Victoria Majekodunmi (Charleville Mézières), Sarah Martineau (Roche Vendée), Julie Paget-Sentagne (Illkirch-Graffenstaden). Guppillotte has 12 players in Serbia for a week's training camp which ends with a couple of games against Serbia. The preparation for the championship will continue with a week in Poland and then the final 12 players will head off to Croatia six days before the start of the European Championship. Clarince Djabdi-Tabdi, Aby Gaye and Marie Mane. Elise Fagnez is the only player missing from the team of last year. Unfortunately she injured herself during the U19 World Championship against Senegal. Guppillotte is to be assisted by Arnaud Brogniet et Yann Fonteneu in their quest to defend the title. The Head of Delegation for the team is Anne-Marie Antoine. Arnaud Guppillotte, le sélectionneur national de l'Equipe de France U18 Féminins, retrouvera deux joueuses du Championnat du monde U19 à partir du 5 Aout, après le stage en Serbie et des matches amicaux en Pologne ce qui sera aussi le moment de dévoiler la liste définitive des joueuses qui vont participer au championnat d'Europe du 15 au 26 août en Croatie.